In a buyers market, sellers need to do all they can to help their home stand up. For many, this includes staging it to improve its appeal. 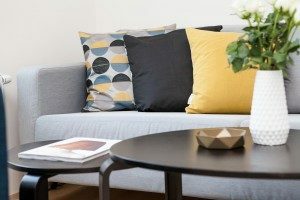 If you are interested in staging your home for buyer inspection, below are some starting tips from AREA Title Agency which can help. Steer away from seasonal decorations and consider a general dinner party or brunch theme. Set up the space for as many people as it can accommodate, to show buyers just how many of their guests can comfortably fit. Don’t be afraid to use hire and use standing lamps to minimize any shadows which can minimize the perception of a space. Keep a reign on your design and don’t overdo it. If you have matching bedside tables, be sure the decorations match, such as a table lamp or clock. Use the same color for the towels and bathroom furnishings you hire or utilize. When choosing flowers, prefer bright gerberas or sunflowers over more romantic roses or similar. If possible, empty out your closet space so that you can show off the storage potential. In addition to the above, when staging your own home, always remember that you aren’t designing it for yourself or even for a buyer, and are instead designing it to show off its best assets. Of course, once your buyers are ready to make an offer they will need to complete their due diligence, such as obtaining title insurance in Toledo, OH which requires a clean title. Speak with AREA Title Agency today at (419) 242-5485 to arrange a thorough title search and make sure that your title is clear from issues and ready for you to start accepting offers.